As long as they are going down, you should be happy. The celiac blood tests were meant to help diagnose celiac disease, but not to monitor the gluten-free diet. However, it is the only non-evasive “tool in the toolbox” for now. You can expect for those numbers to take a year or so to come down. It all depends on how well you do on the diet and how your body responds. Everyone is different! Welcome tomthe forum. I work on a campus that self contained like a college campus, it is in rural America and many individuals have government sponsored carpools and living arrangements. We are all accustomed to having to bring our own food items. We used to have a cafeteria that was celiac/restrictive/allergy friendly, but the contract changed hands and that is not the case anymore. I can not eat there, but it is the mindset that is behind it that is so frustrating to me. Those in the food industry that lack the interest for people who have the situations where dietary restriction is a must is crazy. It is prevalent everywhere. Not only do people not offer options to those that have the restrictions, but they simply do not care. I have a friend who cannot have beef, so she orders chicken. She received steak instead of chicken so she brought it to their attention and the server actually told her "that is not beef, it is steak"! She is not the only one that I hear this from either. Then I hear on TV how those of us that have the issues to deal with on a 24 hour basis inconvenience those that do not. I mean....What?? 1 Week Gluten-Free And I Have The Worst Gas Please Help! @GlutenTootin As mentioned above, limit your carb intake, removing starches, and sugars. Many gluten-free bread/baked products are mostly starches which will be fermented in your gut into gas. Seriously look at the ingredients, all those grain flours, starches etc. Look for nut-based ones with NO starches if you want to enjoy something without the gas. For the most part stick to a whole foods diet, leafy greens, low carb veggies, and meats. Cook them til they are super soft and tender like a roast, stew, soup. Ease the burden on your digestive system. Keep a food diary to see if certain foods make it worse. Also note that it can take weeks for the microbiome in your gut to regulate to a change in diet, more so if you have an overgrowth of bad bacteria or something like SIBO or Candida which grow out of control on sugars/starches and will have to be starved off and then deal with die-off til it is under control. Stuff like this can set up in a damaged gut easy. good article... thank you. another restaurant .. there is a fish and chips place in east oshawa,, hookseys i think it is,, have a separate section and fryers in kitchen, with gluten-free batters for fish and now chicken etc.. haven't been there yet,, but their website explains why they did this after seeing celiac friend etc.. I have been using gluten-free corn tortillas for years as a bread substitute. But I do like bread, so I make gluten-free bread in baking rings. The buns can be sliced into three sections. The middle section is great for french toast; the rest for a sandwich. I wrap them individually in saran wrap and freeze -- then put them in a large ziplock bag. I do the same with corn muffins. Mixing some fire roasted peppers into the corn batter adds some zest and make the final product moist. Crushed cookies make a great 1st layer for desserts. I like a pecan shortbread cookie for this. Also, freeze the crumbs from tortilla chips to crush for coating fish, etc. An easy recipe is to roll finger size pieces of halibut in olive oil and coat with the crushed chips. Bake for 5 - 7 minutes, at the most, in an oven that has been preheated to 500 degrees. Dip them in tartar sauce. Enough said. I have a suggestion for gluten free crumbs - any stale cake or plain cookie can be crushed to crumbs, put into a freezer safe container for future use. AND when a cake recipe does not turn out, crush that too - left over gingerbread cookies from Christmas make a great crumb base for cheesecakes! @PaigeyPants It really depends what province/region you are located in as grocery stores here are rebranded regionally, and have different brand loyalties in different regions. I've done grocery shopping in a lot of provinces, and you have to know what's happening more locally to be sure. As a general rule, most Loblaws-owned grocery stores will have Unico beans (No Frills, Superstore, Independent) though. Since you mention London Drugs, I assume you're in BC. If so, you should have luck at Safeway, Save-On-Foods, IGA as well. Whole Foods and similar alternative/hipstery places will be a bust since they don't sell blue collar foods. edit: the washing the beans thing is legit - GFWD did a report on this, in which she showed that washing dry beans did reduce their gluten content. However, if your beans are severely contaminated (or you find errant grains in them), this might not be enough. I avoid lentils (higher risk), and still wash dry beans and rice no matter how they are labelled (good practice regardless of whether you are celiac). My 12-year-old was diagnosed with Celiac 18 months ago. When he goes off to college, part of the decision about where he goes will unfortunately depend on dining options (not something anyone should have to consider). There are several universities that do a great job of meeting allergen needs. My son is attending a camp at NC State University this summer and they have an electronic system in the dining halls where you basically check your food allergies and the screen shows what can be eaten from that meal’s menu. There is also a gluten-free “island” where there are dedicated toasters, utensils and a refrigerator stocked with dairy free milk and gluten-free breads. When I contacted the University, the Allergen Specialist responded to all of my questions and offered to walk my son through the dining hall and show him everything prior to camp. She also said that all staff are extensively trained on food allergies (including Celiac) and cross contamination. Here is a link: https://dining.ncsu.edu/location/fountain/ I read about another university that has a dedicated stocked kitchen where students can even prepare their own food. Safe dining for a medical reason should be a given at all colleges and universities. It seems like at public universities, there would be some legal standing for students to demand safe food. In US secondary education, it is a legal right. I think the biggest problem is educating people about Celiac Disease. Clearly that needs to begin with the food service/safety industry- which is not being done very well in the US. Is Gluten Consumption a Possible Cause of Skyrocketing Diabetes Rates? Hi Ging. Although I agree it's too little to draw such a conclusion that gluten is the cause, to be fair, the article/study doesn't draw that conclusion. For example, if you click on the BMJ link, the title of the article is "A potential association that deserves closer scrutiny". Given the correlation found, I certainly agree with that and it raises my curiosity too! Also, bread has not been a staple in diets throughout history. In general, grains like wheat have only been part of human diets for about 10,000 years. Is Jimmy Dean Breakfast Bowl gluten-free? There are so many variables in this type of study that it's a thin line to draw such a conclusion. I'd like to see this approach expanded to include countries with a diet heavier on pastas and the like. Bread has been a staple in diets in many countries throughout history, so it would seem unusual to see a rise in diabetes due to gluten ingestion. My understanding is that a slice of bread has approximately 5 grams of gluten. Depending on where/how you were raised and at what time period you might have had toast with breakfast, a sandwich at lunch, and rolls with dinner. That's a lot of gluten. A historical look would be very helpful in seeing a correlation, perhaps, of our adult/elderly population and diets on which they were reared. It certainly makes me curious. I agree, it is difficult and a University should take care of those under their care. Students pay for their meals and should have safe options regardless of what type of dietary need they have. Its difficult for anyone, I have been left sitting without food on several occasions at work. Suring trainings, Staff meetings and luncheons. I was at one breakfast meeting where I was being recognized for my work and could only eat some of the fruit (from an unopened tray, the others had been cross contaminated), their offerings were breakfast sandwiches, Pastries and the fruit tray. During our Christmas party everything was glutinous except for one items, which I watched people put spoons that had been in the pasta into the chicken to retrieve it. So I can relate and it really is not fair to go hungry. I commend her for taking the initiative to start the petition and stand up for herself and all others in the same boat. 04/23/2019 - Looking for a no hassle, easy to please dinner idea? This baked teriyaki chicken comes together in a snap, and cooks in under an hour. 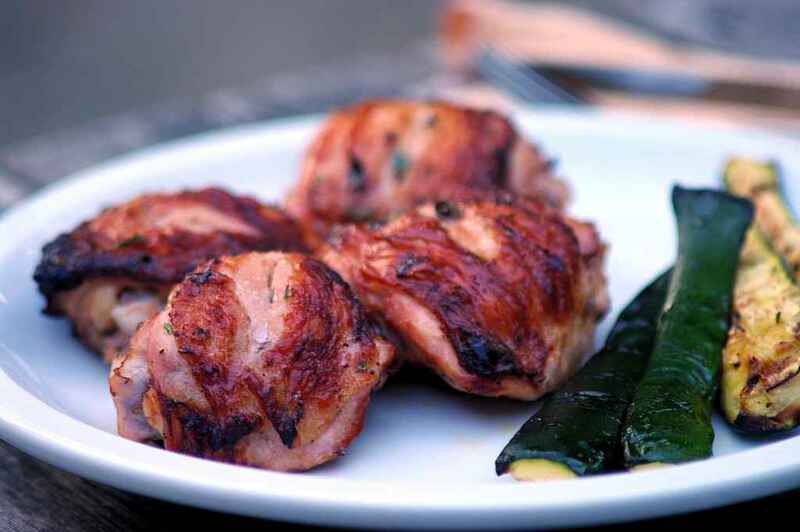 Ingredients: 6-8 chicken thighs 1 tablespoon cornstarch 1 tablespoon cold water ½ cup brown sugar ½ cup gluten-free soy sauce ¼ cup cider vinegar 1 clove garlic, minced ½ teaspoon ground ginger ¼ teaspoon ground black pepper Directions: In a small saucepan over low heat, combine the cornstarch, cold water, sugar, soy sauce, vinegar, garlic, ginger and ground black pepper. Place on the stove top, and bring to a simmer, stirring frequently, until sauce thickens and bubbles. Remove from heat. Heat oven to 425 degrees F. Place chicken pieces in a lightly greased 9x13 inch baking dish. Brush chicken with the sauce. Turn pieces over, and brush again. Bake for 15-20 minutes. Turn pieces over, and bake for another 15-20 minutes, until juices run clear when poked with a fork. Top with sauce every 10 minutes while cooking. I recommend Andalou skin products, which are marked "gluten verified." I've never had any problems. If you sign up for their newsletter, they send out discounts for ordering on their internet site.